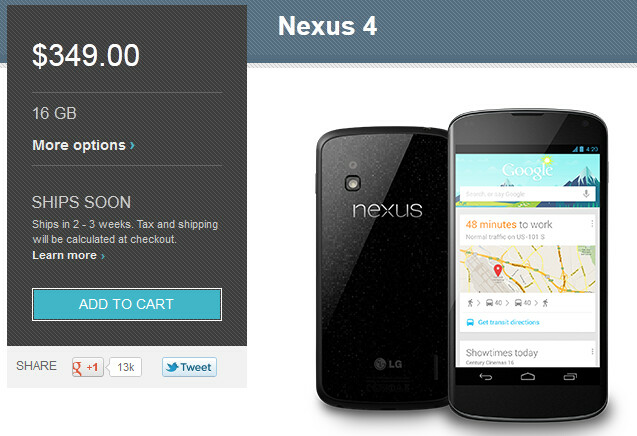 Prayers have been answered, the Google Nexus 4 is not sold out! The Google Nexus 4 is still for sale! Earlier on Tuesday, Google once again started selling the Google Nexus 4 on the Google Play Store. Just like the first time the handset went on sale in the former Android Market, potential buyers had trouble completing their purchase. And again, just like last time, in the blink of an eye Google had put up the "Sold Out" sign. But somebody must have a strong connection with the big guy upstairs, because this time it appears that the Google Nexus 4 was not sold out after all. The high traffic on the site had merely created havoc with those trying to buy the handset. Both the 8GB and 16GB models of the Google Nexus 4 are available for purchase at the Google Play Store at $299 and $349 respectively. That is a heck of a price for an unlocked, top-shelf, stock Android handset. You don't get a second or third chance in life very often. For those looking to buy the Google Nexus 4, you have another shot at picking up the device. Click on the sourcelink if you want to buy the phone, and let us know if you were able to make the purchase! Google really needs to handle product launches better. Agree with you, but still more bearable than Wendy. This phone does also unofficially support T-mobiles forthcoming LTE network(it has a band 4 LTE radio and power amplifier on board), so it is future proof for t-mobile customers. Well look at that, I was right, again. And I was right, again. I said it's an inevitable server outage. No matter how capable Google is, there are always limits to server traffic handling. The 16GB version is shipping in 2-3 weeks. The 8GB version is shipping in 7-8 WEEKS. Looks like I'll be ordering the 16GB version. 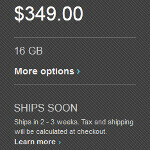 I was going to order the 16GB version anyway, but the shipping date for the 8GB version is insane. The only reason they haven't "sold out" officially yet is because they're letting people order almost two months out. Google, how about you show some love for the rest of the world. Ships in 7 - 8 weeks = Sold out! lol i read that too. GOT MINE ORDERED AND IT'LL BE HERE IN 2-3 WEEKS, F*** EVERY ***HOLE WHO WAS TRYING TO SELL THIS AMAZING PHONE FOR HIGHER THAN THE PLAY STORE!!!! Just checked availability of the 16Gb edition. Ships in 4 - 5 weeks is effectively Sold Out.... Personally, I am enjoying my LTE-enabled Note II right now. Am I being biased? I think its fair to assume elgoog was not prepared for the want of this device. I may be wrong and someone feel free to correct me, but I don't remember them having troubles like this with the gnex. Finally got my Nexus 4 - 16 gig :) They've said 4-5 weeks for shipping but thats all right - its a small price for getting a Nexus in 400 bucks. Had a question though - is it finally confirmed when you get a receipt and an order number from Google or is it still possible to get screwed over? Im just surprised because it went on sale at 12 pm and I booked mine at 9pm which, by past Play store experience, makes it seem iffy. I call Google Play customer support and talked to the staff and her supervisor. They both told me the phone is sold out. Later I saw the sign online saying not sold out, and finally get to buy two 16GB model. Lol there is people buying the 8gig version and selling it for $500 plus on other sites.